Baby & Me is a completely unique language learning experience at TriBeCa Language! It is indeed a major advantage in life to be able to speak a second language and the earlier one is exposed the better. With babies, sensory & motor skill play is combined with music as well as similar tactics you will use to encourage the recognition and repetition of baby's first words in English for second language work. 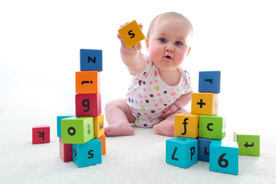 To your process we are able to add the QTALK method for learning words and phrases most necessary in baby's world. NOTE: If you don't see the day and time you need, contact us - we match people up and create custom classes! Also, baby ages listed are just FYI for who is enrolled, not a requirement. Parent/Caregiver + Infant - 24 mos. Winter Session ends April 5th. Come to a trial class now! Join in at any time. Trial classes and pro-rating available. If the days and times listed don't work for you, let us know what you need! We are seeking class partners for Mandarin Baby & Me. Let us know you're looking and what days and times work! Also available upon request: English, Korean, Japanese, Arabic (Levantine or Egyptian dialect), Portuguese, Urdu. Request and schedule at-home tutoring or private lessons. Make up classes not guaranteed If a comparable class is on the schedule, you may make up 1 class per session. The sooner you start the process, the more multilingual vocabulary gets stored into a single file in the brain. This is a big advantage. It's important at this stage to have targeted listening time for your children - language CD's, cartoons, books on tape - as exposure is key right now for them to build association in the brain. Our Baby & Me classes are specifically designed to teach the caregiver the most commonly used questions, commands, expressions and practical vocabulary you will be using with your child in your day to day lives and how to encourage use at home. We teach you how to use common household items in addition to proprietary QTalk Practice Tools to infuse your home with a second language. In bilingual homes, it is helpful if one parent works primarily on English while the other works on the target language. For example, if you have one of those baby's first words books and say, for example, you are looking at a page for YELLOW which has a few pictures of items that are yellow (a chick, a banana, a sunflower) - one parent works with pointing to the pictures and saying the words in English (and when developmentally appropriate, encouraging repetition!) and in another sitting, the other parent uses the same book to work on that vocabulary in the second language.